pH, simply put, is a measure that indicates how acidic or alkaline your body, or more importantly, your blood is. When born our bodies are highly alkaline but as we age, how we treat our bodies and what we put into it turns it more acidic. Why is this so important! An acidic body destroys its own cells, has a weakened immune system, ages rapidly, experiences skin and hair problems, cannot effectively flush toxins, cannot properly cope with cholesterol, cannot properly regulate minerals such as calcium and most importantly cannot maintain high levels of oxygen. Most pathogens and cancers cannot survive in an oxygen-rich alkaline environment. The typical diet is significantly acidic. What happens to your body when you are over acidic? Your body will store the excess acid in your fat cells, which is why so many people have problems losing weight. Overtime, your body will leach calcium and alkaline stores from your bones in a desperate attempt to retain the pH balance in your body - which contributes to arthritis, osteoporosis and that "shrinking" as we get older. ​Firstly check your current pH level.This can be done through your medical practitioner or more easily by getting pH slip indicators from chemists or farmacias. In with the slips is normally guidance so that when you wet a piece of the litmus paper with your saliva it will give you a colour residue. This can be checked against the guidance to give a reading. 2. Fill your plate (see portion control) with fresh vegetables, particularly the dark green leafy kind. 3. Choose root vegetables such as slow roasted sweet potatoes, onions and leaks which are high in insulin. 4. Watch your red meat intake and attempt to keep your servings of acidifying animal proteins down to 4oz per meal the size of a deck of cards. 5. Avoid refined carbohydrates whenever you can, particularly sugar. When you include grains be sure you go for the "whole" grain type. 6. Attempt to avoid or eliminate all processed foods and sauces. The following is a guide to help with food choices. Try the 80/20 approach. 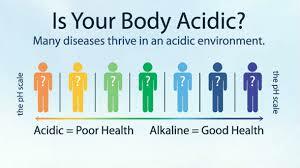 For every 1 serving of acidic food balance with 4 servings of alkaline.